'Tis the season for grilled and charred vegetables and meat. People are gearing up for summer to end, I'm relishing and salad'ing into the last month and a half of the best season of the year. This corn salad is my favorite side dish. The bits of juicy corn kernels pop in your mouth with such a soft sweetness, you won't believe it until you try it. The dressing of sour cream and line juice is tempered with dashes of smoky paprika, cayenne and black pepper. 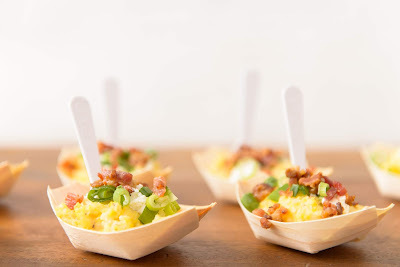 I like adding bits of bacon because, let's be honest, EVERYTHING is better with bacon. Whether it's silver queen, shoepeg or bi-color, this salad is a hit. Preheat oven to 450°F. Place shucked corn on sheet pan lined with foil or parchment paper and drizzle with olive oil. Roast for 20 minutes. Alternatively, cook corn over high heat in a skillet. Cook for about 3 to 5 minutes or until the corn starts to char. 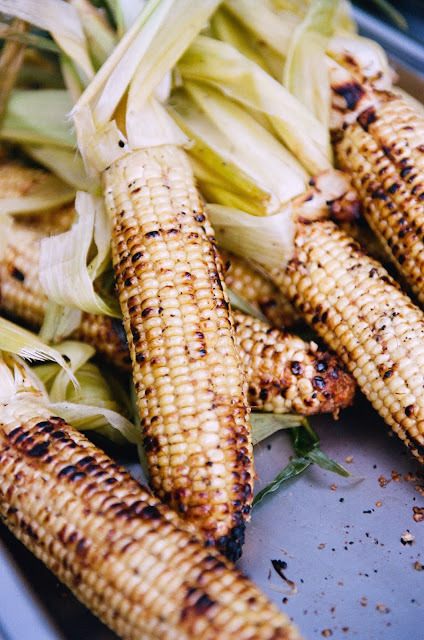 If using frozen corn, you will need a couple minutes extra to get the right charred bits. Cut the corn off the cob. You can also use canned corn or frozen corn, thawed. If using frozen, no need to thaw it out. Transfer the corn to a large bowl and add the remaining ingredients. Stir everything together until well combined. Adjust lime juice and salt and pepper as necessary. To serve garnish with bacon and green onions, if preferred. I love ranch and corn, so this is my kinda dish! Oooh, that sounds delicious, I love practically anything corn!